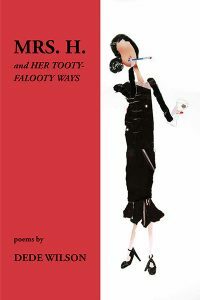 This story of Mrs. H. is Dede Wilson’s seventh book of poetry. Her first, Glass, published as runner-up for the 1998 Persephone Press Award, was followed by Sea of Small Fears, winner, 2001 Main Street Rag Chapbook Competition. Her book Eliza: The New Orleans Years was performed as a one-woman show in Jackson, MS, and Charlotte, NC. In 2017, FutureCycle Press published Under the Music of Blue. Dede’s poems have received first place awards from Keystone Magazine and Kakalak Anthology. 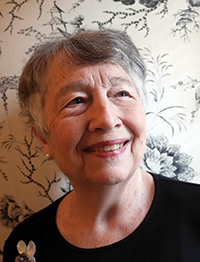 Her work has appeared in Spoon River, Carolina Quarterly, Southern Poetry Review, Flyway, Tar River, Tampa Review, The Southern Poetry Anthology. Polished goblets and finger bowls. upright, and a ramekin of melted butter. Swiss chocolates follow a silky flan. Mrs. H. is tilting her head toward her empty glass. Mrs. H.’s daughter is mashing her fingers into her sweets. Mr. H. is telling a story. You wonder how he will spin it. Mrs. H. is laughing her laugh that has no laughter in it. and paved his perfect roof with perfect slate. and each hinge and knob is solid brass. a home controlled with central heat and air. and rooms designed to fit without a seam. he let her draft the blueprint of their house. until each room was in its perfect place. He studied her plan, then took a second look. Mrs. H. can scramble an egg. stuffed with hair pulled from her brush. making her look strict and severe. the most exotic mother in the world.